Whitby is set on the North Yorkshire coast where the River Esk flows into the North Sea. The original flanking piers were built in timber in the sixteenth century. Alterations and rebuilding to the beginning of the nineteenth century created the present inner stone piers. Short bridges linked them to concrete and timber extensions added in 1914. The West Pier is open to its full length but the bridge link in the East Pier has long gone. Stone lighthouses were added to the West Pier in 1831 and to the East in 1854. The classically fluted stone column of the West Light is occasionally open to visitors to climb. Timber lights, with the west one painted in green and the east in red, tipped the 1914 extensions. 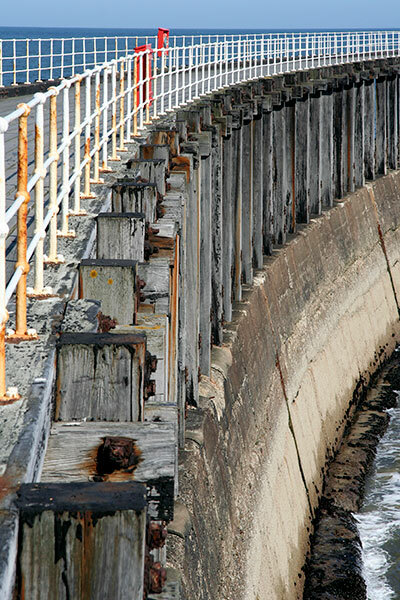 The ladder goes down to the lower concrete level of the pier. Looking shoreward, the curving timber structure on the lower deck creates a fine abstract perspective. Based in Australia, Bambuco creates large scale sculptural forms in bamboo. This is a detail from one of two triangular sectioned towers linked by a delicate tri-cable suspension span across the River Tyne. Constructed as part of a summer festival celebrating the 80th Anniversary of the opening of the Tyne Bridge, the structure remained in place for just a few days. 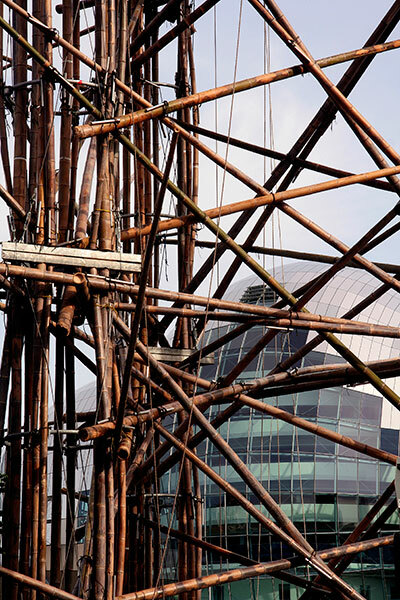 The 2004 Sage Gateshead concert halls designed by Norman Foster stand as background. Opened as the Majestic in 1936 this Art Deco inspired cinema closed as the Odeon in 1981. The main building is in red brick and an illuminated vertical sign once punctuated the entrance façade. This is flanked by two stone panels carrying figurative relief carvings at their base. 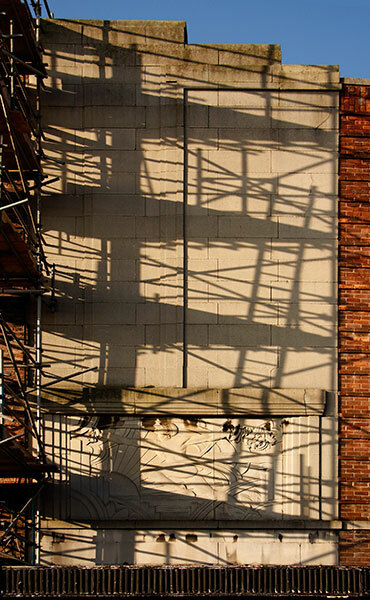 Scaffolding now encloses the sign’s remains and casts its shadow across the façade. Little remains of the original interior and in 2012 the building stood derelict, future uncertain. Between 1837 and 1839 the Newcastle & North Shields Railway constructed the original two-track five-span bridge in laminated timber on stone piers across the Ouseburn. A replacement in wrought iron to carry four rail lines was completed by the Norht Eastern Railway in 1869. Its design replicates those wooden forms and incorporates the original stonework. 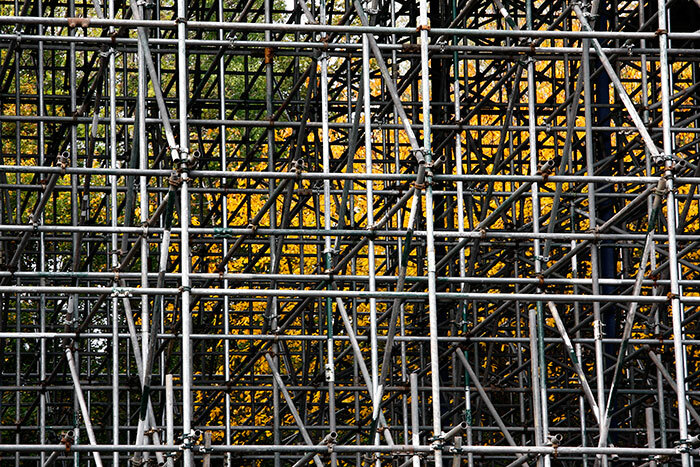 This is a fragment of the scaffolding erected to enable an extensive structural strengthening and restoration programme completed in 2013. 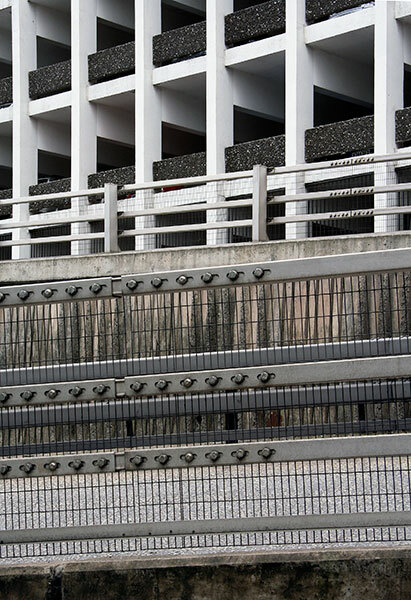 One Sunday an almost deserted multi-storey car park, sporadic road traffic and good light provided calm in which to photograph. 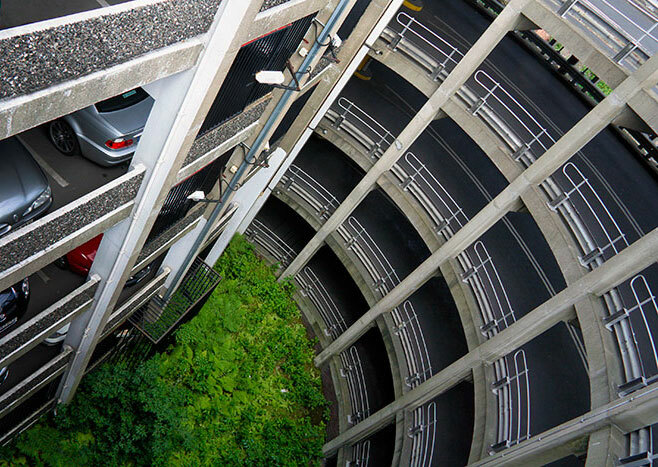 Here, the curving exit ramp and boxed parking levels intersect. The structure is part of an extensive road and building redevelopment forming the Pilgrim Street roundabout at the north end of the Tyne Bridge c.1965. The old surviving buildings to the west look across a bleak concrete traffic whirligig. 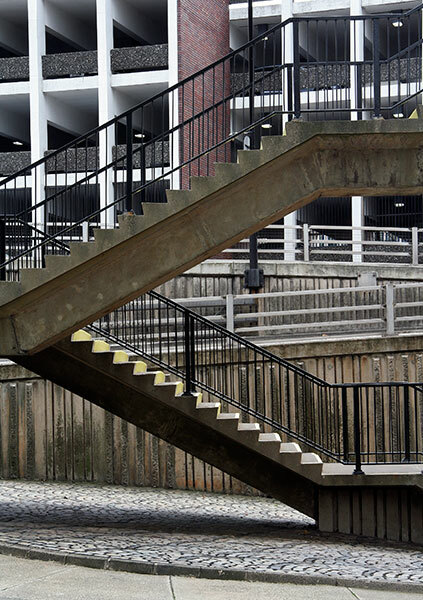 Another exterior composition includes a section of the staircase leading to a footbridge that curves across the inner-city motorway linking the Town Moor to the Tyne Bridge. The associated building redevelopment required the destruction of the Royal Arcade completed in 1832 to the classical designs of John Dobson who took a major role in the design and development of the centre of Newcastle. A forlorn and unoccupied pastiche of the interior is incorporated into the base of its aggressively dominant successor. 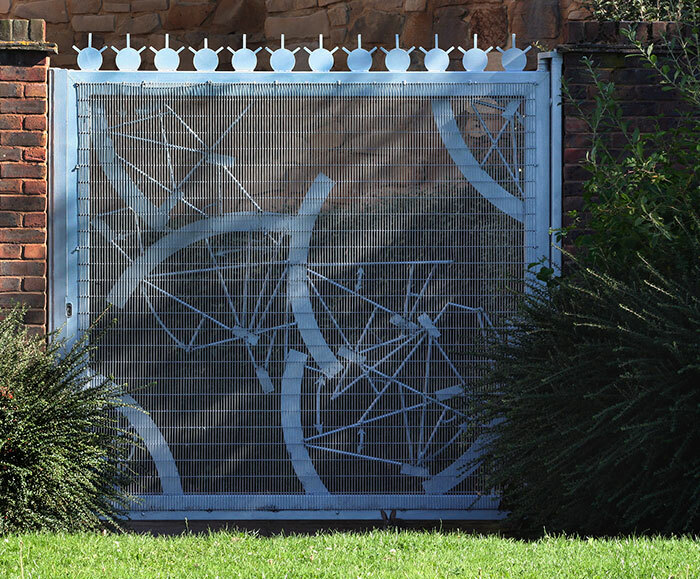 In colour, but close to black and white, the image frames structural forms, patterns and the fixing bolts’ rhythmic arrangement. 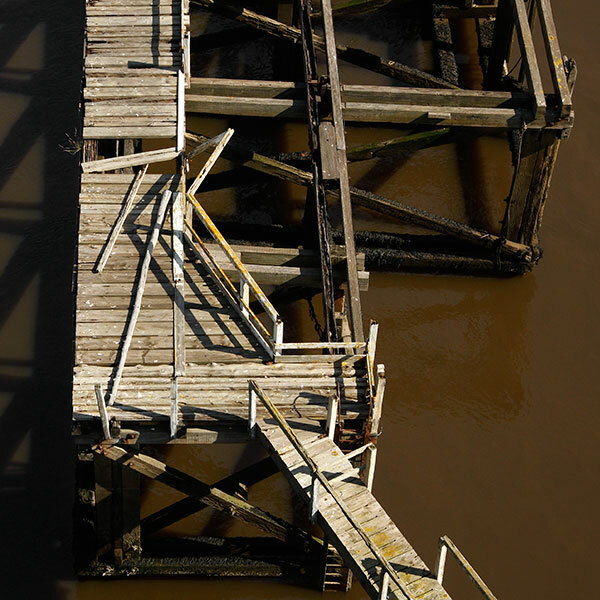 This and the following two images were made from the High Level Bridge across the River Tyne and show a timber structure linking it to the Swing Bridge. Designed by Robert Stephenson and constructed for the York, Newcastle & Berwick Railway it opened for traffic and trains in 1849. 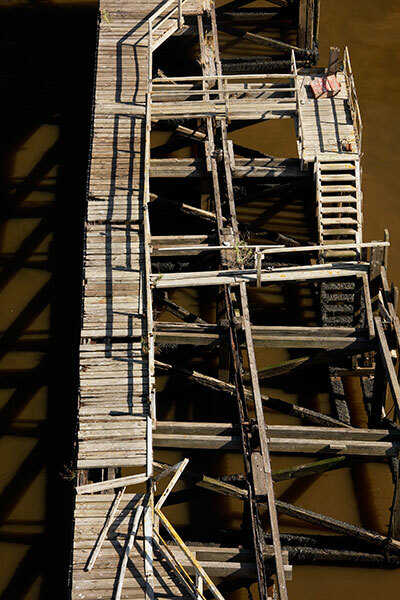 The railway running on the upper level of the five twin-deck river cast iron bow string girders spans is some 112’ above high water: a roadway runs below. Images of this and other Tyne Bridges are in the NEWCASTLE-UPON-TYNE BRIDGES gallery. The three piers standing in the water are protected by timber structures differing in form and function. 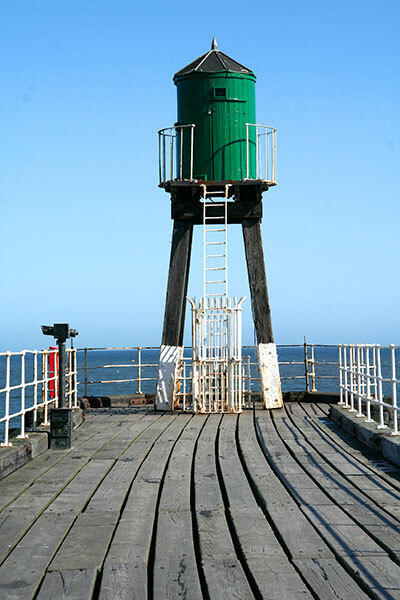 The compact northern one provides basic protection from ships on the river whilst on the southern span it provides a link to the masonry section of the adjacent Swing Bridge. It may have had some secondary function as a jetty. Image 03 in the BRIDGES GALLERY shows a river level view including the seaweed on the timbers revealed at low tide. Recent and heavy rain brought brown soil-tinged floodwater. 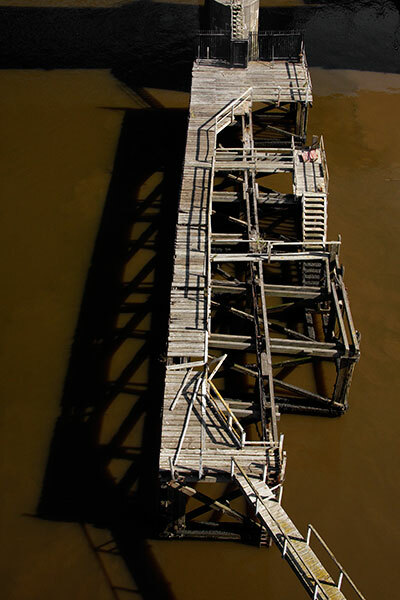 Image 04 in the BRIDGES GALLERY shows part of the much larger timber structure linking the central pier of the Swing Bridge to its corresponding pier on the High Level Bridge. Designed and built by William Armstrong, inventor, engineer, shipbuilder and armaments manufacturer, the hydraulically operated Swing Bridge was completed in 1876. 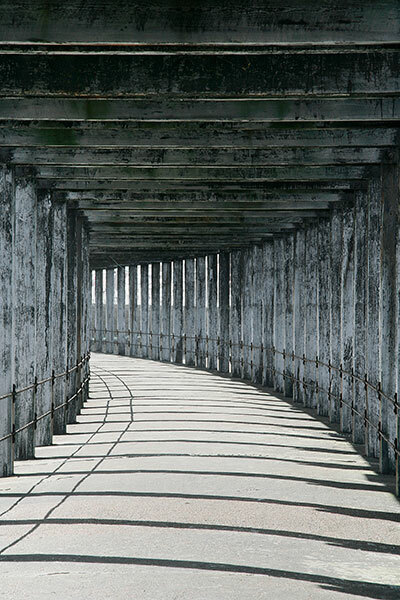 When opened to ships the 281feet long pivoting span rests above the much longer timber structure. Now electrically powered, the original hydraulic machinery still turns the bridge deck. 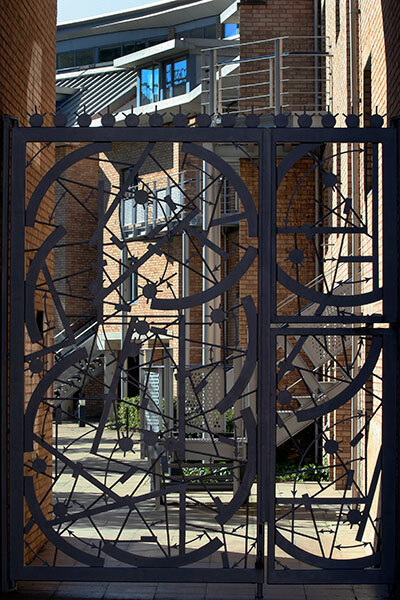 A sculptural gate guards an entrance to apartment buildings. The building’s sunlit façade silhouettes the abstract forms of a second gate. The Y-shaped Lake Union is set on the northern edge of downtown Seattle: it’s edged by housing, floating homes, marinas, ship repair yards and light industry. The narrow southern shore is home to the Center for Wooden Boats and Maritime Museum and the Seattle Museum of History and Industry. The lake is enlivened by all manner of boats and the floatplanes operating from the Kenmore Air Terminal. 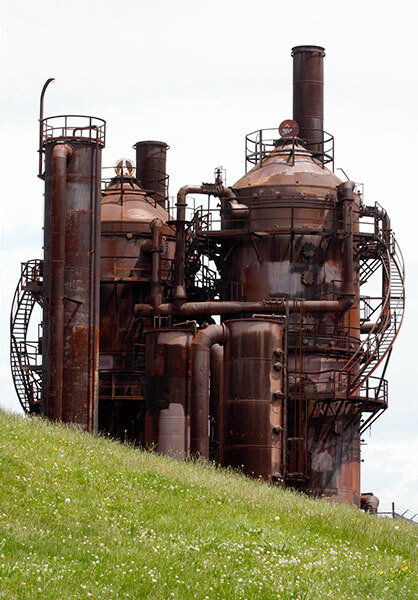 The expansive Gasworks Park occupies the land in between the lake’s arms to the north. Seattle is a young city, its first settlers from the eastern United States arriving in the middle of the nineteenth century. Once forested, the area was gradually cleared for building. Coal was mined to the east and south of the city and was supplied as a solid fuel and for conversion into gas. 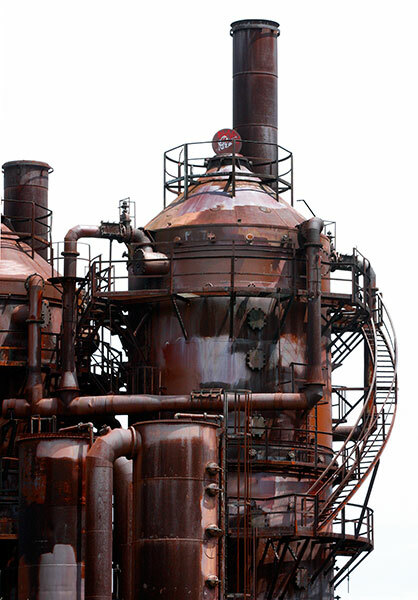 The Seattle Gas Light Company developed their Lake Union gasworks from 1900 and used coal until conversion to oil in the late thirties. Production ceased in 1956 when natural gas came on-stream and made the plant redundant. 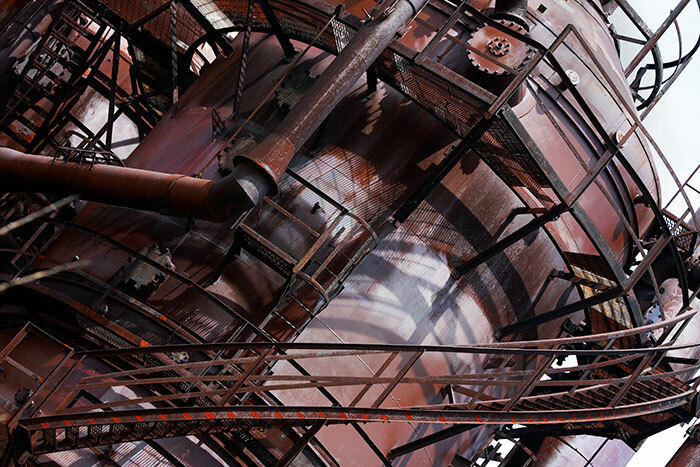 The City bought the site in 1962 and undertook its decontamination and transformation into the Gasworks Park opened in 1975. The railway that served the works was closed in 1971 to become the Burke-Gilman Trail leading ultimately to the City of Issaquah south of Seattle. 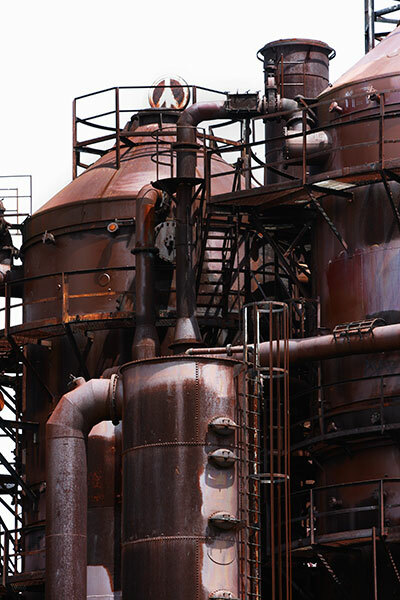 Impressively complex sections of the plant and equipment have been conserved and stand as the only example of its kind remaining in the USA. A Play Barn covers some brightly painted equipment prepared for children’s play. The Park’s contoured grass landscaping offers much activity space or simply somewhere from which to contemplate the lake, the Space Needle and the distant downtown Seattle towers.